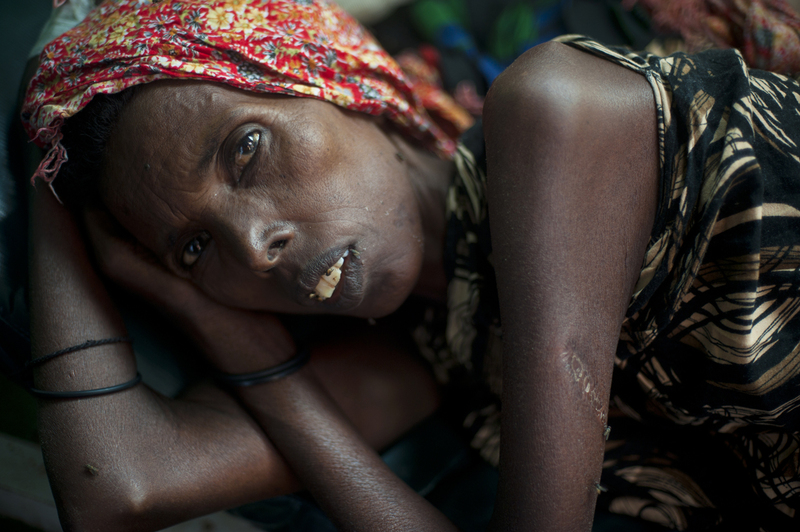 Medina Barako, around 50, lies in the Benadir Hospital ill with diarrhea, and possibly tuburculosis, after she arrived from Dinsor to a camp for internally displaced in Mogadishu, Somalia, August 29, 2011. Thousands of Somalis have traveled to neighboring countries and to the capital city of Mogadishu to escape extreme drought conditions in their villages--an estimated 1.7 million people have become drought displaced, and tens of thousands have perished. The horn of Africa is suffering one of the worst droughts in years, displacing thousands, and killing others through severe malnutrition, measles, and diarrhea.